The Aardvark TJ599E from Sun Joe packs a power punch. Cultivate your garden and get ready for planting with ease. The Sun Joe Aardvark has a cultivating depth of six inches. The TJ599E features four steel tines for maximum durability. The TJ599E is powered by a reliable 2.5 AMP electric motor. No more messing with gas and oil. The Aardvark TJ599E comes with a full two year warranty. 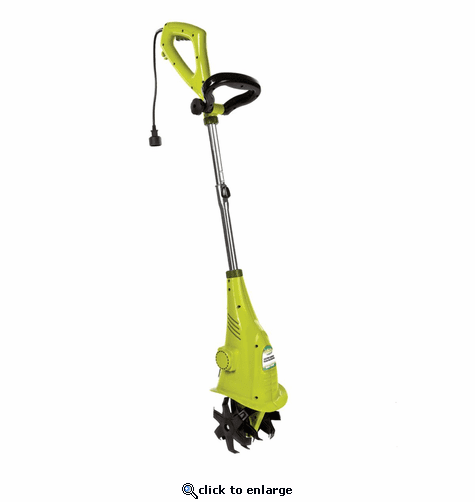 Enrich your gardening experience with the Aardvark from Sun Joe. Due to the size or weight of this item, additional shipping will be added to this order. We do not profit on shipping charges, in fact, we have subsidized the cost to keep it fair. Most large/oversized items will be shipping UPS but some will need to ship LTL (trucking company) depending on cost and size. We will always ship most affordable and quickest way to benefit our customers. We appreciate your business and thank you for understanding. If you have any questions, please feel free to e-mail us at support@thewarmingstore.com or call 888-406-1984.